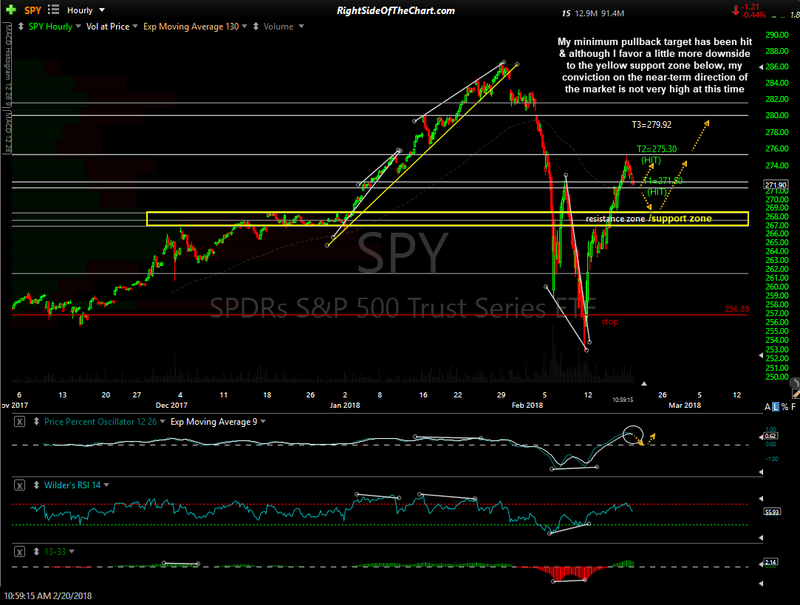 There’s not a lot to add to my last update on the broad markets posted on Friday when the 2nd price target of the SPY Active Long Swing Trade was hit. So far the expected pullback off T2 has played out to my minimum expectation which was/is the former resistance, now support zone which T2 was set just below. 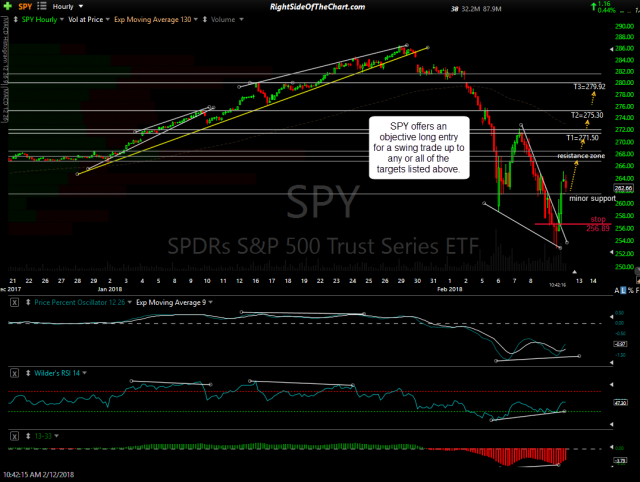 Previous & updated 60-minute SPY charts below. 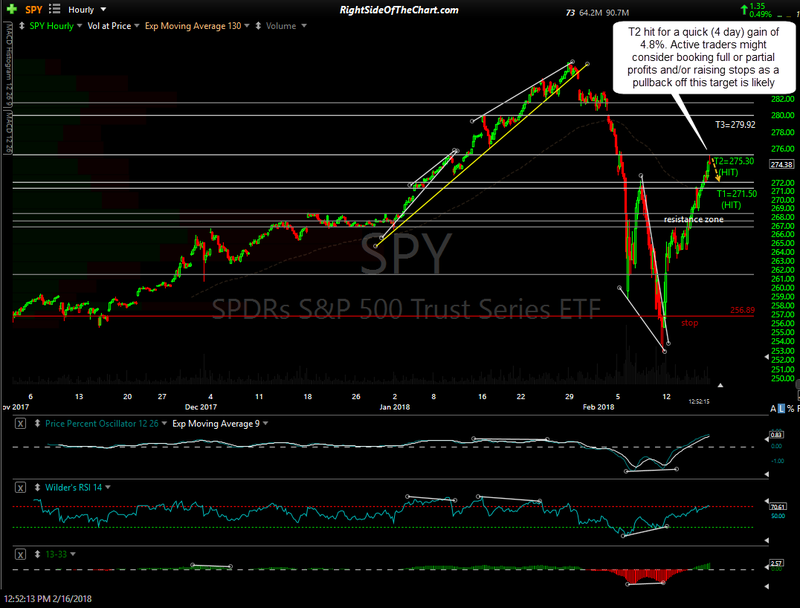 Click on first chart, then anywhere on the right of each expanded chart to advance to the next full size image. 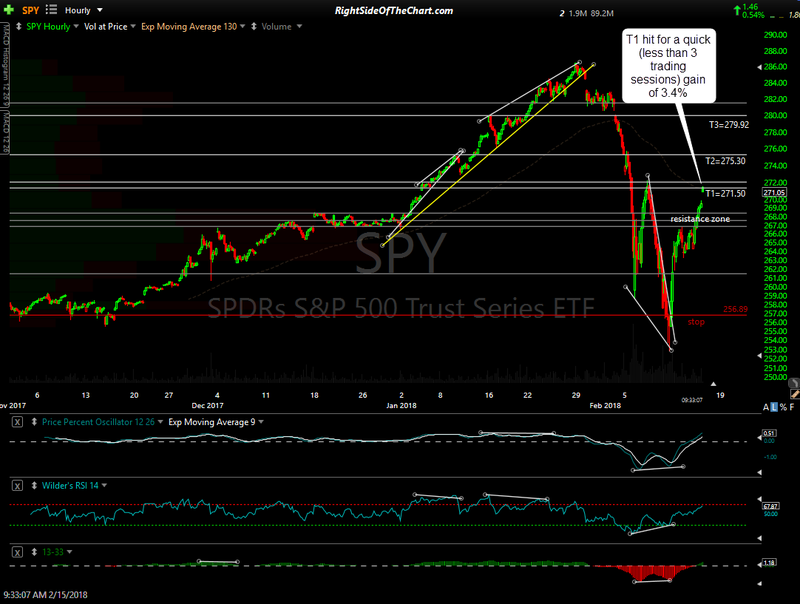 While I’m leaning towards a little more downside, quite likely to the former resistance, now support zone that runs from about 268.55 down to 266.95, my conviction on the very near-term direction of the market from here isn’t very strong. As such, I’d prefer to see how the market acts on this pullback before adding back some or all of the broad market longs that I closed out last week. Best to not force any trades right now so my plan is to revisit some of the recent trades as well as the potential trade setups on my watch-list & wait patiently for the next high-probability trade entries. FYI- I noticed that the UGAZ trade barely clipped the suggested stop on Friday. I still like that trade, expecting a rally in natural gas & will likely add it back as another official long swing trade after posting an update on that trade to move it to the Completed Trades category. For those that gave the position a little more room on the stop, the price targets for the next official long will remain the same.